Almost a year since its release, I’ve finally gotten round to watching one of the controversial movies of 2016, Batman vs Superman: Dawn of Justice. My short review is, I liked it! True, it’s not a masterpiece of cinema, but it’s not the dog’s dinner that I’d been led to believe, I feel! Following the events of Man of Steel, the world is beginning to question Superman and his motivations. Should one man have all that power and be allowed to run around unchecked? Highly controversial stuff, I’m sure you’ll agree! The government decides to step in and call him to account. Meanwhile, Bruce Wayne is looking into a Russian weapons trafficker and discovers a link with LexCorp, so infiltrates their computers to get some intel. At a party there, he meets antiquities dealer Diana Prince, and once he manages to decrypt the data he steals from the corporation’s mainframe, discovers she is actually a metahuman warrior. Lex Luthor has been investigating a couple of these folks, and alongside this research has also been attempting to import some kryptonite found in the Indian Ocean to act as a deterrent against Superman and his ilk. It turns out that Luthor is genuinely against these super-human types running around the planet, and determined to check them. Unfortunately, he’s also kinda crazy, and attempts to turn the world against Superman by blowing up the Congressional hearing, where only Superman survives the blast. Berating himself for not seeing the duplicity, Superman goes into exile. Meanwhile, Batman steals the kryptonite from LexCorp and turns it into a weapon to defeat Superman, and Lex obtains the corpse of General Zod and access to the Kryptonian scout ship held in isolation in Metropolis. He also kidnaps Martha Kent in order to bring Superman out of exile. Superman returns to Metropolis, and Lex explains he wants the world to see that the alien is not all good; he must kill Batman in order to save his mother. Lois Lane, learning of the plan, follows Superman to Gotham. Batman and Superman start fighting, and the weaponised kryptonite gives Batman the upper hand. Just as he’s about to plunge a kryptonite spear into Superman, Superman gasps out that he needs to “save Martha” – which was also the name of Bruce Wayne’s mother. Lois arrives to explain, and Bruce promises to save her. Batman manages to defeat Lex’s Russian terrorist allies and save Superman’s mum, while Superman confronts Lex at the scout ship. Lex has also been busy, however, and has created an abomination from both Zod’s body and his own blood: Doomsday. Superman and this abomination battle it out in Metropolis, but each time Superman defeats it with his heat-ray eyes, the mutant grows stronger. Superman flies it up into space, where the military decide it can safely be nuked with no collateral damage, and launch their missiles. Unfortunately, that just gives it more energy to grow stronger still. Diana, about to leave Metropolis, sees the battle on the news and decides she needs to stay – when Batman manages to lure Doomsday to Gotham’s abandoned docks, he is almost killed before Diana, now in her Wonder Woman get-up, deflects the energy blast on her bullet-proof bracers. Superman recovers from the nuclear blast and also joins the fray, while Lois attempts to recover the kryptonite spear as the only way of killing the monster. Superman leaves the fight to go help her, though being in close proximity to the spear weakens him all the same. 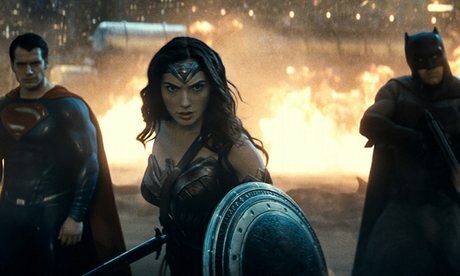 Wonder Woman manages to contain it with her lasso of truth, and Batman manages to use his last kryptonite gas canister to weaken Doomsday enough that Superman can fly in close enough to thrust the spear into the abomination, though as it dies it manages to stab him with a bone, causing a fatal wound. There’s a lot of story here, as you can see! There are elements from the comics brought in to support an otherwise original storyline, and I think it actually works out really great. I’m not about to write up some kind of apology for the movie, don’t get me wrong, but I thought overall it was a really good movie. There are some things that I kinda wish had been done differently, or could have been explained better, or whatever, but overall, I really don’t think this film deserves the amount of negativity it has gained. First of all, Ben Affleck is a fantastic Batman, and I just loved Jeremy Irons as such a bitchy Alfred. There is definitely a movie in there that I want to see! Henry Cavill as Superman is perhaps a bit odd, he certainly seemed a lot more serious than I’d expected for Superman. But it’s a very serious movie, and I think he did as good a job as could be expected. A lot of folks have talked about how Superman is supposed to be such a bright character, but I think Cavill had a sense of bemusement as to why the world seemed to be so against him, when all he’s trying to do is help, and I thought it came across quite well. Wonder Woman was terribly under-used, unfortunately, but I suppose it’s just made me more excited for the upcoming movie this summer! Jesse Eisenberg’s Lex Luthor was simply annoying – a lot of people have complained about the fact that he has hair, but personally I don’t really mind the fact that he looks different. It was more the fact that he came across almost as a caricature of the cackling evil madman, and it just annoyed the hell out of me. We get some tantalising glimpses of Flash, Cyborg and Aquaman in the movie, who are all set to be in the upcoming Justice League movie that is also due out later this year. There is a lot of story here, and the movie does seem to jump around with a lot of exposition before we really know where we are. Part of me wonders whether that might be part of the problem with the film: it demands too much of our attention. You have to actually watch it to follow it, rather than just browsing your phone while it’s on in the background, and looking up whenever there’s a fight or whatever. Maybe I’m just being a snob when I say that, though. As I said before, it’s not like I’m trying to be an apologist for it, I just think it’s a lot better than people seem to want you to believe. Sometimes, of course, the film does sag under its own weight of story, and I have to say, it was a little confusing at times as to why some characters were doing what they were doing. Why do Batman and Superman even fight? Sure, Lex explains he wants the world to see Superman kill Batman, but why is Batman so up for it? I get the impression we’re supposed to believe he thinks Superman is no better than the criminals he’s been fighting in Gotham all these years. But it’s never adequately explained, for my liking. There is actually a DC comics series of Batman vs Superman, and I never really managed to get into that either. To me, while Batman is usually the one to distrust everyone, I don’t ever see him actually fighting Superman, who should so clearly be a force for good in the world. The film runs to a little over 2 hours 10 minutes, but I feel it could have done with perhaps an extra half hour of material to really flesh things out. We’re still in that tenuous sort of era where movies can’t always go much over 2 hours without being really tremendous, but I’d happily watch a longer feature if it meant a proper story. And I think this is a perfect example of a movie that needs that – we’ve got two absolute titans of the comic book world! They need to be fleshed out properly! Comparisons with Marvel I suppose must be made, though I haven’t yet seen Civil War so can’t comment on that whole thing. While I would say that Marvel’s movies do tend to be much brighter and whatnot, and a lot of people have heavily criticised this film for taking such a dark stand, I think it fits with the story perfectly, and would say again that such reviews have been too harsh. It’s not a Marvel movie, correct – it was never meant to be, after all! DC are clearly doing their own thing, and lightness of tone are probably better kept for Flash and Green Lantern. I don’t think a comic book movie has to be comical, after all. This is a movie that is definitely worth watching. I let other people put me off going to see it for far too long, now, and I think the lesson I’ve learnt here is, don’t listen to the popular opinion of DC movies! It’s worth watching to make up your own mind, and even if you don’t agree with me, I still think that’s a valuable lesson to take from all this. Previous Previous post: More DC!